Thanks very much for having me on Close Encounters with the Night Kind today. What a fun place to visit! The holidays are such a busy time of year, and it seems like we’re always running somewhere, hurrying to do something, or falling behind. So today, I’d like to share some fun music. Sidelined Afterlife, my latest book, released this week, and the playlist I used while writing different scenes in this book includes some songs and artists I had never heard of before. Each song helped me create a vision of what would happen in a particular scene. Hope you have fun listening to the tunes! Every Storm (Runs Out of Rain) by Gary Allan Link: http://www.youtube.com/watch?v=1q3LEadIk3w Why I used this song: There’s a thunderstorm during the first scene of Sidelined Afterlife, and I wanted to set the tone that, although things were stormy, they would eventually be okay. Kind of my theory about life, too! I’m Not Okay (I Promise) by My Chemical Romance Link: http://www.youtube.com/watch?v=qRFhNZNu_xw Why I used this song: This song is not my usual taste at all. But really, I didn’t pick it…heroine Veronica did. She’s pretty good at hiding her emotions, so I listened to this song a lot before/during writing a lot of her songs. Wrap My Mind Around You by Trent Dabbs Link: http://www.youtube.com/watch?v=rPyYP_z521E Why I used this song: Hunter, the hero of Sidelined Afterlife, needs Veronica’s help. But he cannot understand her at all. Guess he’s going to need to get to know her better, right? This song helped me get in Hunter’s head…his confusion about figuring out Veronica. And his feelings for her. Only Happy When It Rains by Garbage Link: http://www.youtube.com/watch?v=esEdC0c3YI4 Why I used this song: Ha! Another rain song. Are you sensing a theme here? LOL. Veronica is…well, for lack of a better word, pissed when the story begins. She truly believes she is happiest when she’s in pain because she’s had so many tough times. Come to Life by Trent Dabbs Link: http://www.youtube.com/watch?v=AlzR9zUTqQQ Why I used this song: This is Hunter’s song. He’s realizing he’s in love, and needs Veronica to see it, too. This was the perfect song to listen to while I wrote the scenes where they were fighting their feelings for each other. It literally has the words “ticking clock” in it, too. And there’s a ticking clock they’re racing against when they need to help a ghost cross over into the next world. Cool, huh? You Make It Real by James Morrison Link: http://www.youtube.com/watch?v=rRxccy-zcJ8 Why I used this song: This is another song I used for Hunter’s scenes. He sees that she is the woman for him, but he hasn’t convinced her yet. He wants to tell her how he feels, but can’t quite open up to her. But if you listen to this song, you’ll know how he feels. Make It Without You by Andrew Belle Link: http://www.youtube.com/watch?v=TICJw1NEWaM Why I used this song: Uh oh. Sad song alert!! I listened to this song over and over again to understand how Veronica and Hunter feel when they think they won’t be able to be together. The black moment when they think they’re better off without each other. Stubborn Lover by Sugar and the Hi Lows Link: http://www.youtube.com/watch?v=K8T5FM_dz6k Why I used this song: Yay, a happy song! They’re together! They’re happy! They’re having fun and I dare you to listen to this song and not sing along to the chorus. LOL. Thanks very much for coming along for a tour of my playlist. 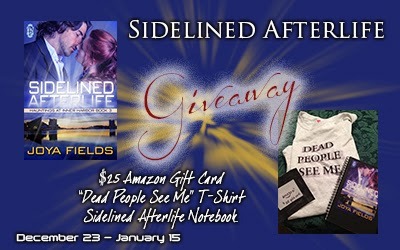 Here’s hoping you enjoy reading about Veronica and Hunter in Sidelined Afterlife. 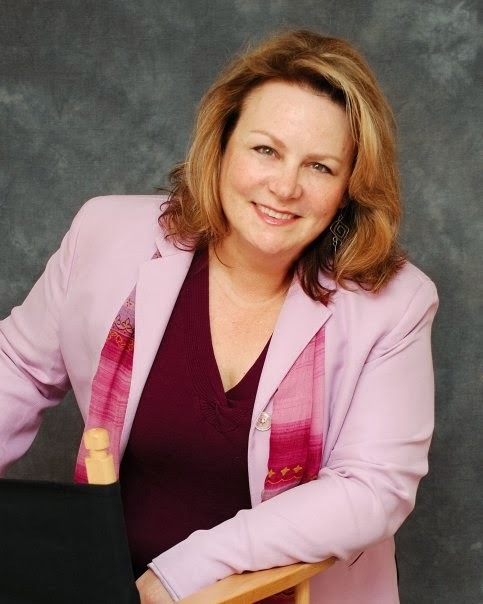 Veronica Matthews hates her psychic-medium "gift" of being able to communicate with ghosts and dying people. All it's ever brought her is pain and grief. 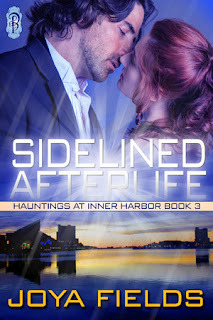 When her neighbor Hunter Anderson, an ER doctor, realizes her talent, he begs her to help get rid of the ghost that’s been haunting him for two years and endangering his job. She’s torn—her need to help the attractive man who saves peoples’ lives wars with her guilt over not being about to lead police to crime victims until they were already dead. She agrees to help Hunter. They soon find out the ghost is likely to turn dangerous if he doesn’t cross over to the next world in the coming weeks. After losing his wife in a tragic accident, Hunter's only solace is his work. 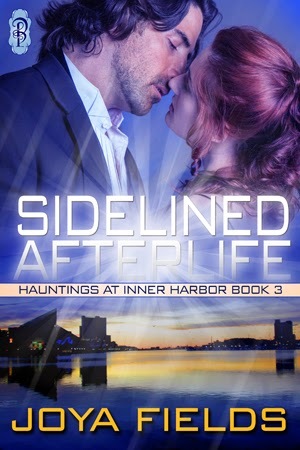 The ghost that haunts him jeopardizes the one thing he cares about. But spending time with Veronica, getting to know her passionate lips and sassy attitude, gives him something new to care about. She can't risk her heart... he’s afraid to love and lose again. Can a ghost help them break through a barrier of mistrust and guilt?